Maps are in PDF format, you may need certain program installed on your computer to view these maps. When the file you intend to download has the suffix pdf, you will need to have Acrobat Reader installed to open it. Acrobat Reader can be downloaded free of charge. here. The Great Southern Trail (GST) is a unique 96km (60 miles) stretch of countryside in West Limerick/North Kerry. It is the route taken by the Limerick - Tralee/Fenit railway line, which opened in stages between 1867 and 1887. Most of the route closed between 1975 and 1978 but remains the property of CIÉ ( the National Transport Company). Much of the development as a recreational amenity has been undertaken by the GST Ltd. which is a voluntary group assisted by various Local and State agencies. 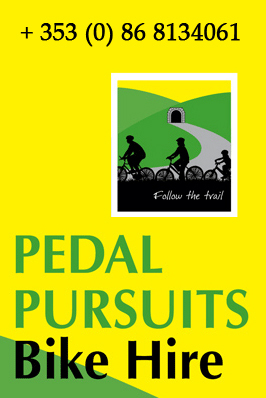 Today (May 2012) the GST is suitable for off road walking and cycling along 36km of the Co. Limerick section of the route between Rathkeale and Abbeyfeale. In Co.Kerry a short stretch has been developed near the Lartigue Museum in Listowel and work has commenced on the Tralee-Fenit section. Síneann Slí an Mhór-Dheiscirt (GST) feadh 96km(60 míle) trí Iarthar Luimnigh agus Tuaisceart Chiarraí. Leanann sí líne an iarnróid, Luimneach – Trá Lí/An Fhianait, a d’oscail i gcéimeanna idir 1867 agus 1887. Dúnadh an chuid is mó den slí idir 1975 agus 1978 ach fós is le CIÉ an líne. Tá Slí an Mhór-Dheiscirt(GST Ltd), grúpa deonach a fhaigheann cabhair ó ghníomhaireachtaí Áitiúla agus Stáit, freagrach as an gcuid is mó den bhforbairt mar áit taitneamhachta. Faoi láthair (Bealtaine 2012) tá an GST in úsáid mar áis easbhóthair do shiúlóirí agus do rothaithe feadh 39km i gCo. Luimnigh, idir Ráth Caola agus Mainistir na Féile. I gCo. Chiarraí tá forbairt déanta ar phíosa gairid in aice le Músaem Lartigue i Lios Tuathail agus tá obair tosaithe ar an gcuid sin ó Thrá Lí go dtí An Fhianait. Le Great Southern Trail (GST) traverse sur 96 km une belle région de l'ouest du comté de Limerick et du nord du comté de Kerry en République d'Irlande. Le GST n'est autre que le tracé de l'ancienne ligne ferroviaire Limerick-Tralee/Fenit, ouverte par étapes entre 1867 et 1887. Pour sa plus grande partie, elle fut fermée entre 1975 et 1978 mais elle reste toujours la propriété de la CIÉ, la société nationale des transports. L'essentiel des aménagements en chemin récréatif a été entrepris par la GST Ltd, un groupe de volontaires soutenus par diverses agences locales et nationales. Der Great Southern Trail ist eine 96km lange Bahnstrecke in West Limerick/Nord Kerry. Sie wird von der Limerick - Tralee/Fenit Railway Line befahren und wurde zwischen 1867 und 1887 eröffnet. Ein Großteil der Strecke wurde zwischen 1975 und 1978 stillgelegt, verblieb aber im Eigentum des nationalen Transportunternehmens CIE. Die Weiterentwicklung zu Freizeitzwecken wurde von der GST Ltd. vorangetrieben – eine Gruppe von Freiwilligen, die von lokalen und staatlichen Behörden unterstützt wird. El Great Southern Trail (GST) atraviesa con sus 96 km una bella región del oeste del condado de Limerick y del norte del condado de Kerry en la República de Irlanda. El GST aprovecha el trazado de la antigua línea ferroviaria Limerick-Tralee/Fenit, abierta a tramos entre 1867 y 1887. La mayor parte del ferrocarril, se cerró entre 1975 y 1978 pero la CIÉ, empresa pública de transportes, mantiene su propiedad. La parte fundamental de su transformación en camino recreativo ha sido realizada por el GST Ltd, un grupo de voluntarios apoyado por diversas agencias locales y nacionales. The Great Southern Trail (GST) to odcinek terenu o długości 96 km (60 mil) w zachodniej części hrabsta Limerick oraz w północnej części hrabstwa Kerry. Tamtędy właśnie przebiegało połączenie kolejowe Limerick - Tralee/Fenit, którego odcinki zostały oddane do użytku w latach 1867 – 1887. Większość trasy została zamknięta w latach 1975 -1978, ale w dalszym ciągu pozostaje ona własnością CIÉ (the National Transport Company). Ten teren został przekształcony w dużej części w teren rekreacyjny przez GST Ltd., która jest organizacją wolontariacką wspieraną przez różne lokalne i państwowe instytucje. “La Great Southern Trail (GST) attraversa con i suoi 96 km una bella regione dell'ovest della contea di Limerick e del nord della contea di Kerry, in Irlanda. La GST copre il tracciato dell'antica linea ferroviaria Limerick-Tralee/Fenit, aperta in varie fasi tra il 1867 e il 1887. La maggior parte del tracciato fu chiusa tra il 1975 e il 1978 ma la CIE, azienda pubblica dei trasporti, ne conserva la proprietà. GST Ltd, associazione di volontariato, si è presa carico di gran parte della sua trasformazione in percorso ricreativo, con il patrocinio diversi enti locali e statali. There are over twenty access points to the GST from various public roads; these facilitate locals and those who wish to do loop walks/cycles. Apart from the entrance at Rathkeale Trailhead all others are to the north of the N21. Ardagh: The entrance is at the railway bridge on the local road L7001 which links the N21 with the R523. Parking is at the Community Centre 200m from the railway bridge. Newcastle West: There are two entrances one at Bishop Court (off Bishop St., town centre) and the other near Gaelscoil Ó Dóghair/ Recycling Centre on the R521. Templeglantine: Parking at Halla Inse Bán on the local road L21006 (directly opposite the Church) ;the trail is 1km north along this local road. Devon Road: At Devon Road Cross turn north off the N21/R515 junction and travel along the L7059 where Tullig Wood is clearly visible to the right. Abbeyfeale: In the town centre turn right from the N21 onto the R524 (Athea road) where the old Station is on the right after 1km (adjacent to the 'Railway Bar'). The Southern Trail is generally a Class 2 walking and cycling trail. While this trail can be cycled - it is necessary to dismount to open gates along the route. This is a level section and begins at the Old Station [now the Palatine Centre; a museum dedicated to the settlers from the Palatinate in Germany who arrived in Ireland 300 years ago to escape persecution www.irishpalatines.org . After a few hundred metres the River Deel is crossed and then the trail moves to the north of the N21, crossing the road by means of a riverside underpass. The westward journey continues through lands associated with the Palatines. Five beautiful cut-stone overhead bridges are encountered on the trail to Ardagh. Just before the third one, on the right, can be seen the ancient Churchyard at Clounagh and the ruins of 15th Century Lisnacille Castle in the distance. On the approach to the fourth bridge, about a mile further on, a local road at a right angle [90 degrees] to the trail leads to Cahermoyle House (now a private Nursing Home) which has associations with William Smith O' Brien leader of the 1848 Young Ireland rebellion. The fifth bridge is at Ardagh Station from where the village, St. Molua's Well and the old fort where the Ardagh Chalice was found in 1868 can be visited. This section is level at each end with a 'dip' in the middle in the form of a 1% gradient. It passes through pleasant pastoral farmland with views of the surrounding hills. As Newcastle West is approached the River Daar is bridged. 500 metres further on the R521 is crossed on the level and Newcastle West station is entered. The only survivors of the railway age are the restored Station House (private) and the mature oak trees which lined the approach avenue. The N21 roadside cycleway continues into a short section of a cul-de-sac road before the sight of old telegraph poles indicate that the railway has been regained. This was the western end of Barnagh Station; the tunnel and railway house are at the far side of the N21. The route is pleasant passing through cuttings and embankments and under two stone bridges. The village of Templeglantine becomes visible on the left and is reached along the L21006. Templeglantine is a good starting point for a side trip to Glenquin Castle (restored) [5Km] and Killeedy Castle (ruin)/ St. Ita's Churchyard [7km].This excursion will also afford great views of a modern Wind farm. The L21006 leads to the trail where a left turn is taken for Abbeyfeale. After 2Km Tullig Wood is entered and its tranquil atmosphere is in sharp contrast to the noisy N21 only a couple of fields away. Shortly after the restored station at Devon Road is passed; once serving a local Creamery. The trail now levels out as it comes parallel to the River Allaghaun and keeps company with it until Abbeyfeale. One stone bridge spans the trail and 2km later the Station at Abbeyfeale is reached. Turn left onto the R524 for the town centre. Much progress has been made on the 22 miles [35 Km] of continuous walking/ cycling trail along the old railway from Rathkeale to Abbeyfeale. Until 2011 the continuity of the trail had been broken by the N21 at Barnagh and Rathkeale. The provision, by Limerick County Council, of 1.5 miles [2.5 Km] of dedicated cycle-lanes parallel to the N21 has resolved this issue. On the Barnagh section of the route along the N21 road, there is a short section of trail, (which does not make up part of the main trail) leading to a railway tunnel originally on the line (see photo). This may attract users off the main trail. To access this spur, users must cross the N21 road. Please note that no signs warning motorists of pedestrians/cyclists crossing the road at this point. Dogs are permitted on the trail, please read a code of conduct for all trail users and observe the Leave No Trace Principles or Country Code. Full width (farm gates) are used across the trail at some road junctions and at points where landowners have land on both sides of the trail and have a need to move animals or machinery from one side to the other. In general, beside each large gate there is a small swing gate with a spring mechanism keeping it closed or a kissing gate to allow trail users to pass through. While walkers will not be hampered significantly by the need to pass through kissing gates or swing gates, the presence of these gates is a problem for cyclists. In the case of many of the kissing gates, the space to get a bicycle through is limited. In some cases depending on the length of the bike it is not possible to get through the gate and in most cases it requires a lot of manoeuvring by the cyclist to get through. Route obstructed for cyclists – gates across the trail at many points block or hinder progress of cyclists. It is important to make it clear that anyone cycling the trail should be prepared to open gates and in some cases lift their bicycle across a gate. To ensure you have the latest news on which sections of the trail are developed for walking or cycling call Trail Secretary on Tel: +353 (0) 69 62597 or email the Tour guide who is a West Limerick native. 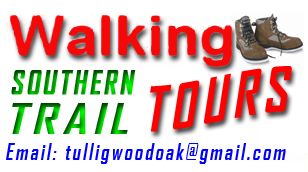 The tour operates daily, for more information email Tour Guide Dennis McAuliffe tulligwoodoak@gmail.com The tour has been designed to give you the freedom to explore and experience Tullig Wood and Barnagh Tunnel sections of the Southern Trail at your leisure.